San Francisco — We are pleased to announce Passage, Val Britton’s first solo exhibition at Gallery Wendi Norris. Presenting a sitespecific sculptural installation alongside a collection of twodimensional, mixed media works, this exhibition continues Britton’s exploration of memory, imagination and the potential of abstraction. Based on the language of mapping, Britton’s abstract, collaged worksonpaper were initially inspired by her father, a long haul truck driver. After losing her father at an early age, the artist searched for ways to process the emotional impact. Using maps of the routes he often travelled as her point of reference, Britton began to fragment and mutate her father’s itineraries, piecing together the past while inventing histories forever unknown to her. Working in an explorative mode, Britton’s abstractions explode across the canvas, creating space, depth and texture, rendering visible the navigation of memory’s complex terrain. Using cut paper, drawing, painting, ink and watercolor, Britton’s collages are at once topographic and ethereal. Within each work, aspects of the familiar arise from her enigmatic formations. In “Reverberation #11,” pools of varying shades of blue resemble a suite of lakes seen from above. 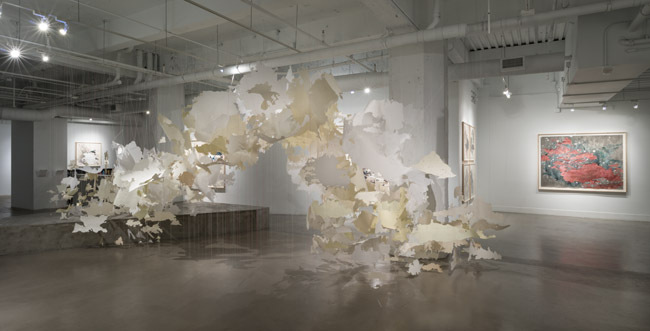 Beneath, lines and orbs of cut paper assemble into a network of intersecting lines, forming a coordinate system born of the artist’s imagination. Ultimately unrecognizable, the piece demonstrates Britton’s deft ability to explore the tensions between the concrete and imaginary. Passage coincides with the completion of Britton’s extensive public installation at the San Francisco International Airport, a project awarded to her by the San Francisco Arts Commission in 2012.